Reading Country Club has yet again had the astonishing achievement of receiving two top honours at the 2015 Ekurhuleni Golf Union’s Awards Evening in November last year. Club Professional, Donovan Main (30) received the highest honour as Club Professional of the Year whilst Reading’s Food & Beverage Manager, Stuart McLaren (46) was awarded Caterer of the Year. Donovan, who joined Reading Country Club in 2011, can be described as an excellent all-rounder in the golf industry. Not only is he Club Pro playing off a 5 handicap, but he is also a renowned coach, helping golfers from beginners upwards understanding and shaping their game. Donovan owns the pro shop, Mainly Golf, at Reading where you are sure to find the latest attire and sound advice. Donovan took up the game at the age of 18 when he started working as a pro shop assistant at a golf course in Richards Bay. “There was no turning back,” he says and in 2011 he completed his three-year PGA diploma, qualifying as a club professional. Donovan is married to Marianka, who fortunately understands the many challenges a professional in this industry can be subjected to. “Throughout my working career, I have been in the hospitality industry,” says Stuart. He worked in a Holiday Inn and a Sun International hotel before he ventured into the golf club industry. Zebula, Randpark, Pollack Park Germiston Country Club and eventually Reading where he now enjoys the support of the whole club. 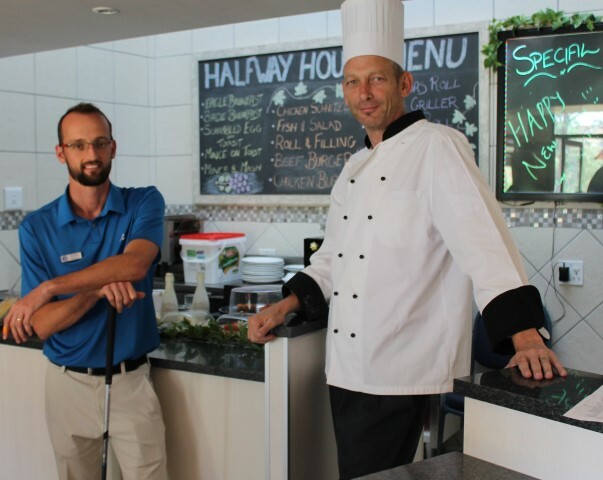 “Our halfway house has been transformed under his tenure and functions are thriving with numerous compliments from satisfied customers,” says Dave. And just so that he can keep up with the golfers, Stuart manages a game of golf every now and again, playing off an 8 handicap and justifiably proud of it! Reading’s club professional, Donovan Main and Food & Beverages Manager, Stuart McLaren received top honours at the Ekurhuleni Golf Union’s Awards Evening in November last year.